Mr Bercow’s charismatic style at times catches the ire of pro-Brexit supporters who often accuse him of taking the side of pro-Remain MPs. Despite that, his style has made somewhat of recognisable figure within the public. Ms Pelosi is currently on a US congressional delegation tour of the UK, Germany, Ireland and Northern Ireland. The speaker, who is second in line of succession to the presidency following Mike Pence, has recently called for a security review to protect Ilhan Omar. Ms Pelosi called for the review after Donald Trump tweeted a video attacking the Democrat. Ms Pelosi’s call for the review was made based on a series of tweets threatening Ms Omar’s life before Trump’s tweet. The speaker said: “Following the president’s tweet, I spoke with the sergeant-at-arms to ensure that Capitol Police are conducting a security assessment to safeguard Congresswoman Omar, her family and her staff. 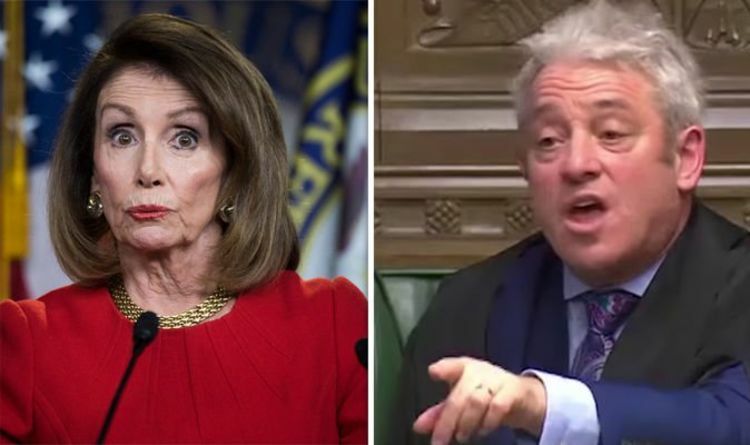 Ms Pelosi and Trump have been in constant battle following the Democrat’s rise to Speaker for the second time in her political career. Recently Ms Pelosi claimed that Trump was committing an “assault on the Constitution” during an interview with CBS. In response, Trump hit back at Ms Pelosi saying: “Such a “puff piece” on Nancy Pelosi by 60 Minutes, yet her leadership has passed no meaningful Legislation. “All they do is Investigate, as it turns out, crimes that they instigated & committed.